Have you ever massaged your kale?! I didn’t really understand why kale salads were so popular until I learned the massaging trick. Bitter and tough, but loaded with flavor, vitamins, minerals, and fiber, kale has a well-deserved reputation as a numero uno leafy green. And when you break down its defenses with a little salt and a lot of tough love, it yields, becoming less bitter, more flavorful, and able to stand up to luscious dressings for days. All you do is remove the tough ribs, chop the kale into slivers or bite-sized pieces, and place it in a very large bowl. Add a pinch of salt, toss the leaves to distribute the salt, and start massaging. Just grab handfuls of kale, rubbing them against each other and squeezing the leaves. It’s similar to kneading dough, and the harder you are on the kale, the more tender it will be later. The massaging action breaks down the kale’s cellulose structure, leaving it tender, silky, darker in color, and less bitter. The best way to know if you’ve massaged it enough is to take a little bite: if it’s still leathery or bitter, it needs more of a rubdown. This salad has a sweet-and-sour balance—thanks to the lemon, maple, and dates—with the nutty crunch of slivered almonds against silky, chewy kale leaves. Place the kale in a large bowl. Add a pinch of salt, then use your hands to massage the kale vigorously for 2-3 minutes (or more). In a small bowl, whisk the lemon juice, maple syrup, garlic, salt, and red pepper flakes, then drizzle in the olive oil while you continue to whisk. Pour the dressing over the kale and mix with your hands to coat the leaves. Place in the fridge to marinate for about 20 minutes. Meanwhile, toast the almonds in a dry pan over medium-high heat, until they’re golden brown, about 2 minutes. Keep an eye on them; they can burn quickly! Set aside to cool. 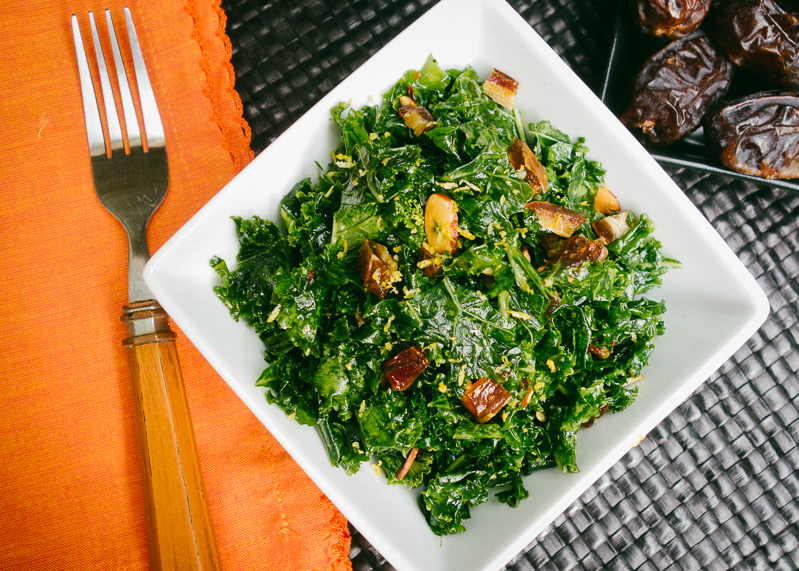 To serve, toss the kale with the almonds and dates, then top with a little sprinkling of lemon zest. This salad stays fresh without wilting for 2-3 days in the fridge. So, putting that all together… here’s another delicious flavor combo: apricots, pecans, honey, and orange juice. Or… dates, cashews, honey, and lemon. You’re welcome. Best kale recipe ever. 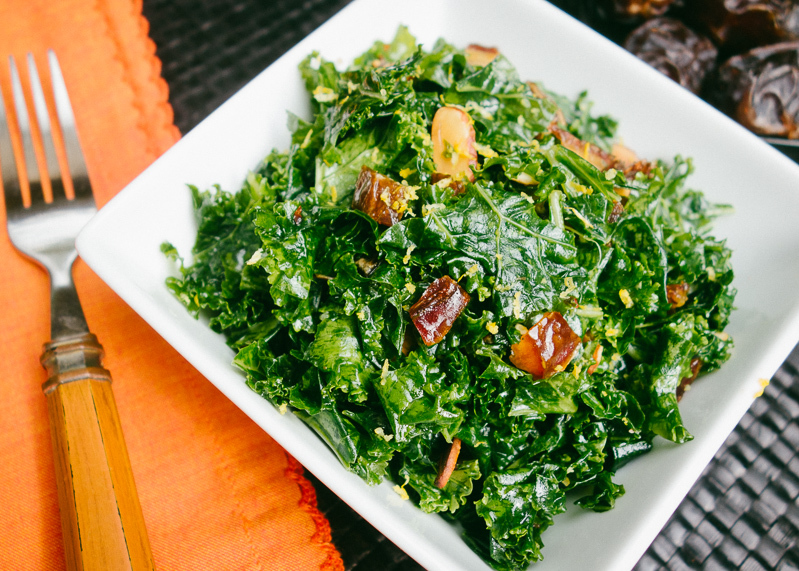 I hate kale, but it’s healthy and inexpensive, so…. I’m always looking for new ways to prepare it and his was great! I used orange juice and honey instead of lemon/maple. (I can’t keep maple syrup in the house as I would drink it like a fine wine, I love it so much.) It turned out delish. Thanks for the recipe! I’m so glad you liked it! And I hear you on the maple syrup. I actually caught my husband Dave in the act of eating a big spoonful of it one day, just ’cause. I mean, it is THAT good. I got addicted in Quebec eating maple syrup bread pudding, pre-Paleo days. If I have it in the house, I invent ways to use it, haha. My favorite syrup is from Hidden Springs, in Putney, Vermont. I grew up in NYC area, and visited VT and Quebec often. Enjoy autumn in Vermont! I miss it! The weather is starting to get really pretty — although it’s supposed to be 90 next week, so I guess we’re in for a little bit more heat/humidity before fall really kicks in. We’re visiting Montreal in November, and I can’t wait! First visit to Quebec. I just made something so similar to this the other day. I happened to have some left over cubed roasted butternut squash and added that to the kale and it was delish! Will have to try it with the dates. Excellent recipe. My hubby says it’s the best kale he has ever eaten. Thanks Mel! I’m so happy it was a hit! Kale for everyone! Well, you did it, Mel, you got me to eat kale. One of my co-workers brought this salad to our pot luck on Thursday so she and I would have something to eat and I could almost single-handedly ate the entire bowl. Lemon Kale salad: it’s what’s for dinner!